Few days back I was craving for some ‘Kosha Aloo r Dom’. The kind of what we used to had in the bus towards the way of Winter picnic. That not so good looking paper box (kagojer baksho) used to be full with the flavors of good food. Luchi-Aloo r dom and mishti was those things what made that oil spotted paper box very special, and of course the joy of picnic, the fun, constant chattering with friends & family. Those good old days. I had all the ingredients ready in my pantry. But wanted to add some new twist to the recipe. 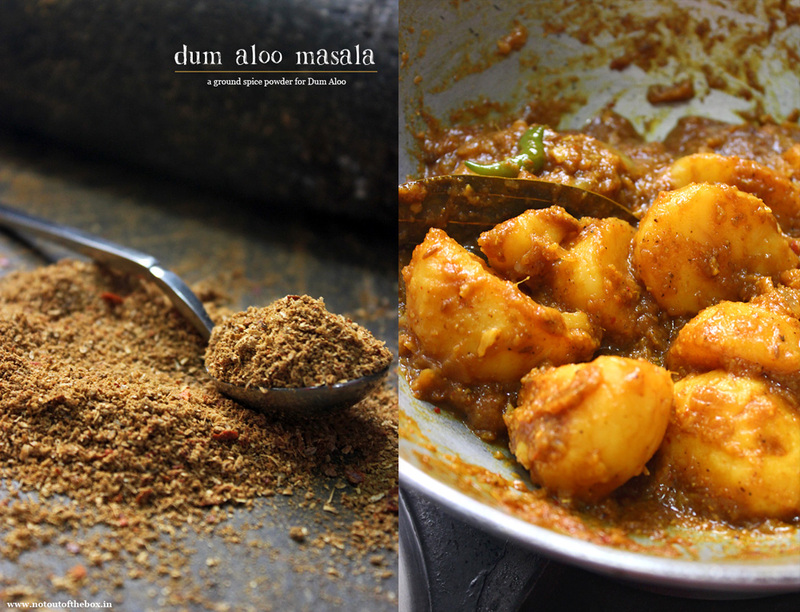 I made this spice powder specially to cook Dum Aloo. And it was a hit. Next time I’ll make this masala in a large batch to make any kind of Dum Aloo. In a frying pan dry roast all the ingredients on medium flame till fragrant. Care should be taken not to burn the spices. Let it be cooled for few minutes. Grind them to a coarse powder using mixer or sheel-bata (stone grinder). To make this masala, I used sheel-bata. Cause the ingredients were less in quantity for mixer. If you are using a mixer, just double the ingredients, and store the masala in an airtight container. Potatoes-6 medium sized (Boiled and peeled. Poke a few holes in the potatoes with a fork, and cut into halves). You can use baby potatoes too. Heat oil in a deep frying pan. Temper with bay leaf and cumin seeds, once it splutters add the grated onion and cook till light brown in color. Next to add the ginger and garlic paste, mix and fry for a minute. Add dum aloo masala, turmeric powder, salt and green chilies. Mix well. Fry this on medium heat till the masala starts leaving oil. Now add the boiled potatoes. Mix well with the masala & fry for 4-5 minutes. All this on medium heat. Add 1 cup of water, mix and cook uncovered on low flame till the raw smell of masala goes. The gravy will be thicker, so stir in between to prevent from burning or sticking to the bottom of the pan. Add sugar, mix & cook for another 2-3 minutes. Add lemon juice and garam masala powder, mix and remove from heat. Garnish with coriander leaves. Your hot and spicy dum aloo is ready. Serve hot with luchi, paratha, puri, kachori or roti. 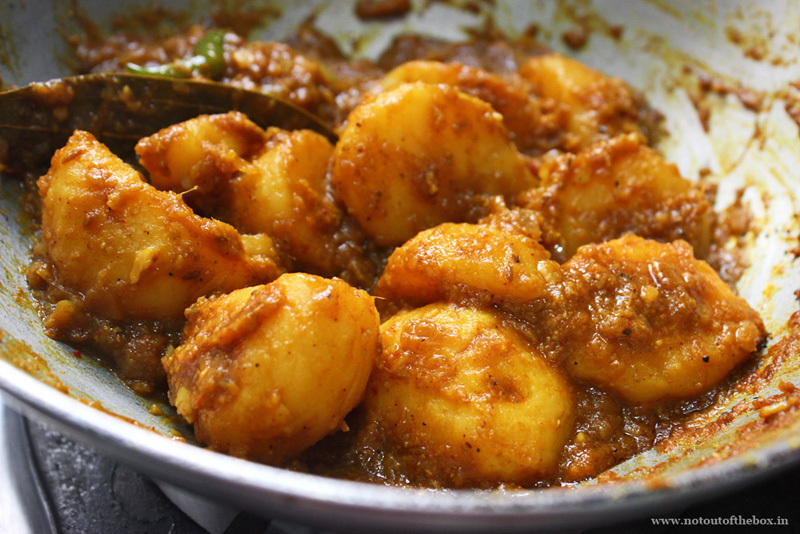 Thanks a ton for this fantabulous recipe of aloor dum.Sounds delicious & easy to cook. I intend to cook it ASAP . Looks so delicious and flavourful!! Will try soon! !